I’m happy to report that work has completely finished on it and I’m so pleased with the way it turned out. Let me get you up to speed on what I did these past few weeks. 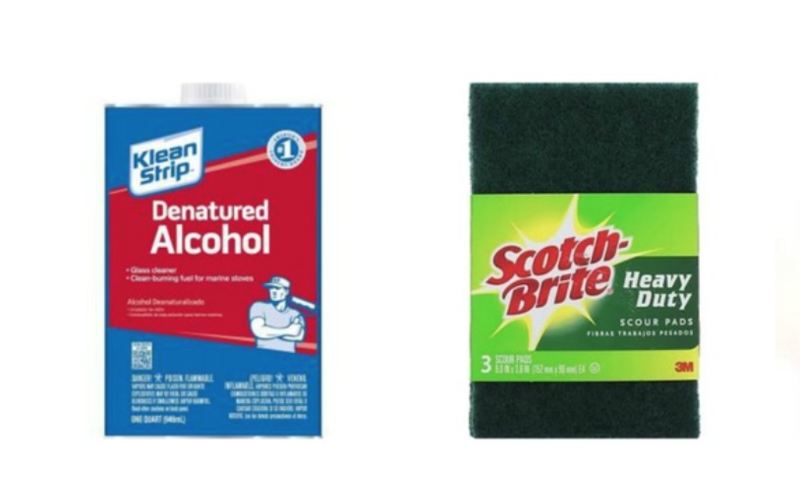 Once the settee was completely stripped down to its bare frame, I cleaned it thoroughly with a 50/50 mix of denatured alcohol and water and a green Scotch-Brite pad. 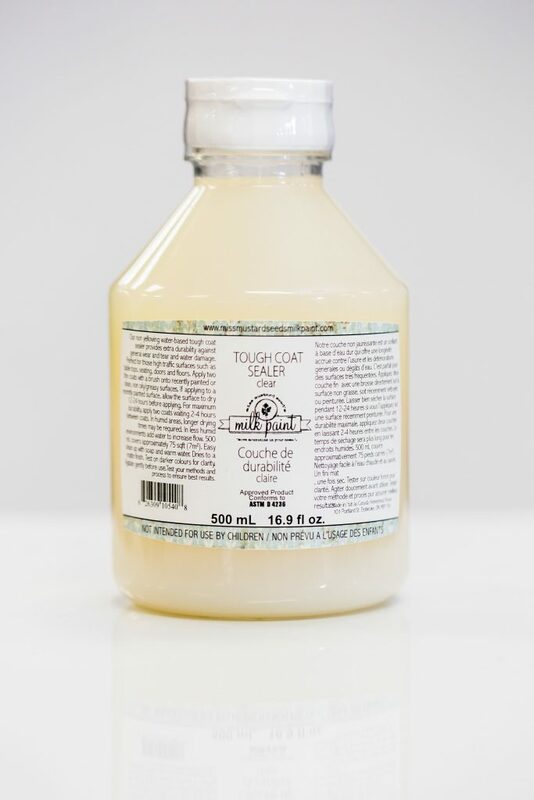 This got rid of surface dust and oil from people’s hands over the years. The cute little feet were total dust traps! I also kind of “flossed” the back splats. (And yes, they’re called splats. That’s not a typing mistake!) A splat is the vertical part of a chair back. Not only does it help give the piece of furniture structure and support, but the splat also helps you identify the style of furniture. Who knew splats were so important? 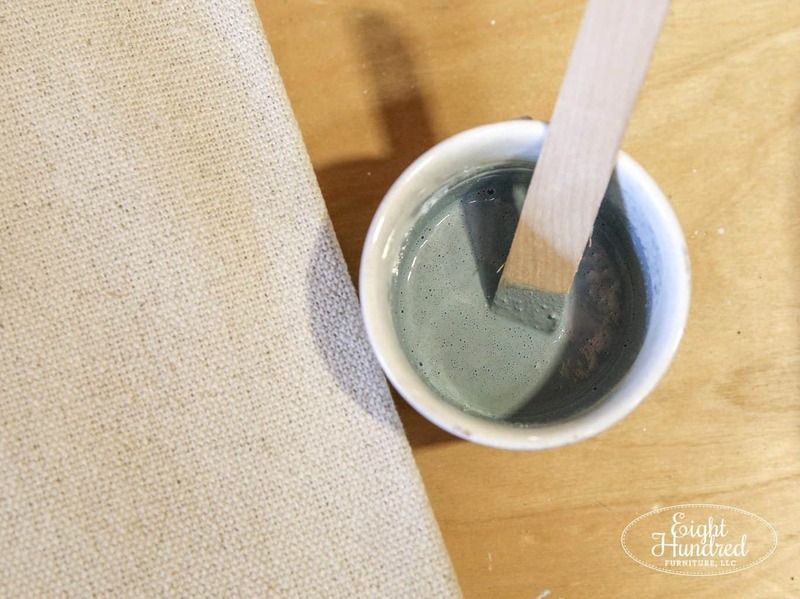 Once the settee was clean, I painted on a layer of Tough Coat by Miss Mustard Seed’s Milk Paint. 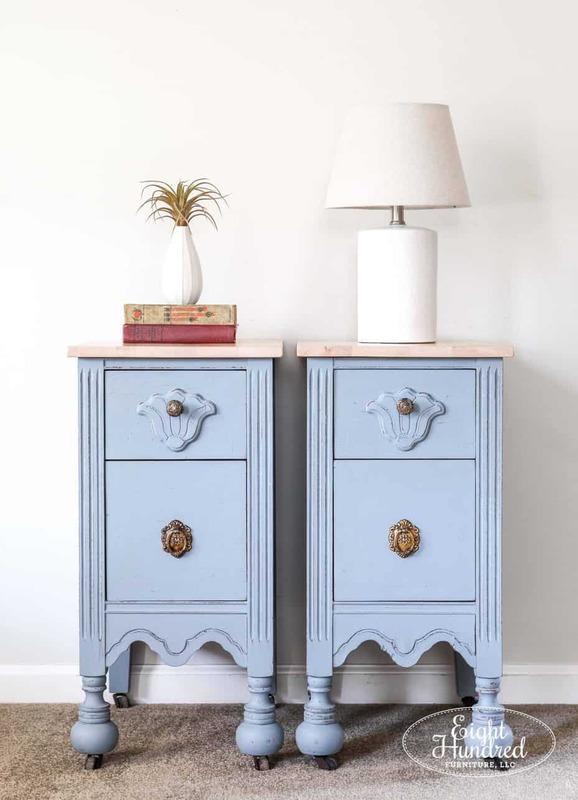 The reason why I did this is because the existing finish was too slick for Milk Paint to stick. Now usually you scuff sand to help MMS Milk Paint adhere, but I didn’t want to scuff sand the entire frame of the settee. It has a lot of curves and hard to reach places, so I used a bit of trickery! 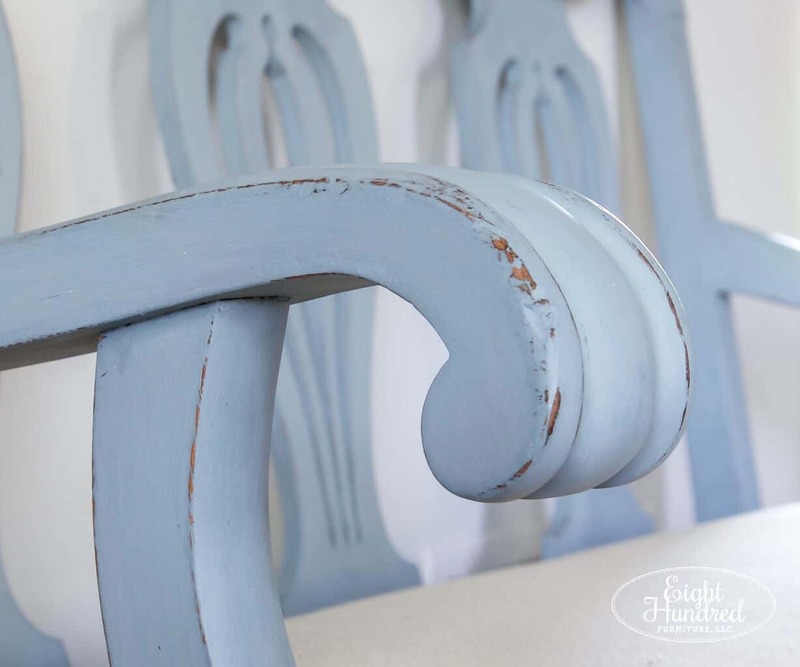 MMS Milk Paint will stick to Tough Coat. 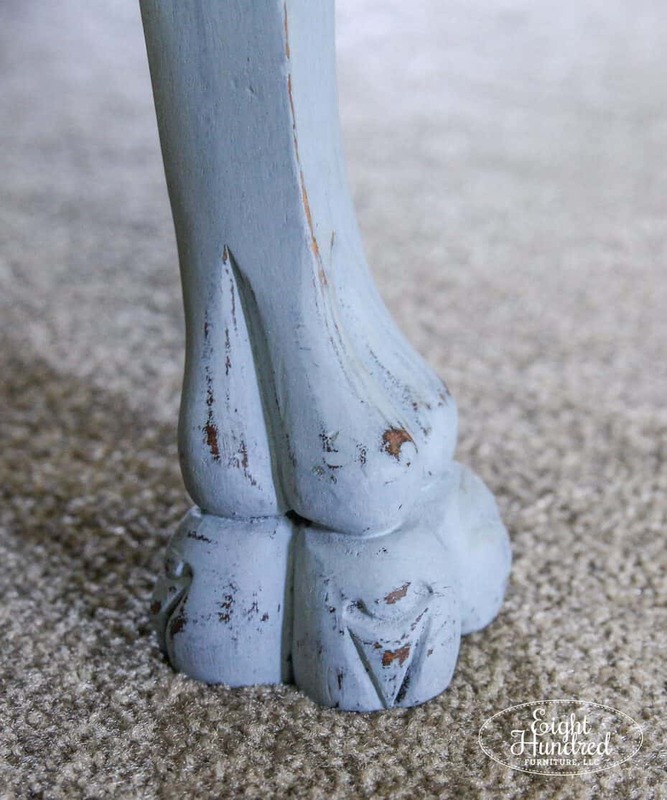 So instead of sanding and making a mess, I painted on a layer of clear Tough Coat and allowed it to dry, thus creating a surface my MMS Milk Paint would adhere to. 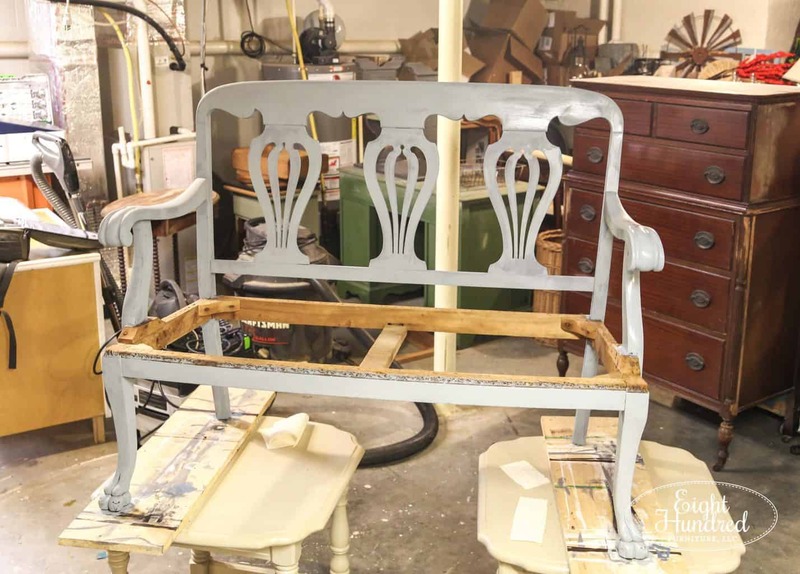 As the Tough Coat dried, I mixed up a batch of Bergere by Miss Mustard Seed’s Milk Paint. 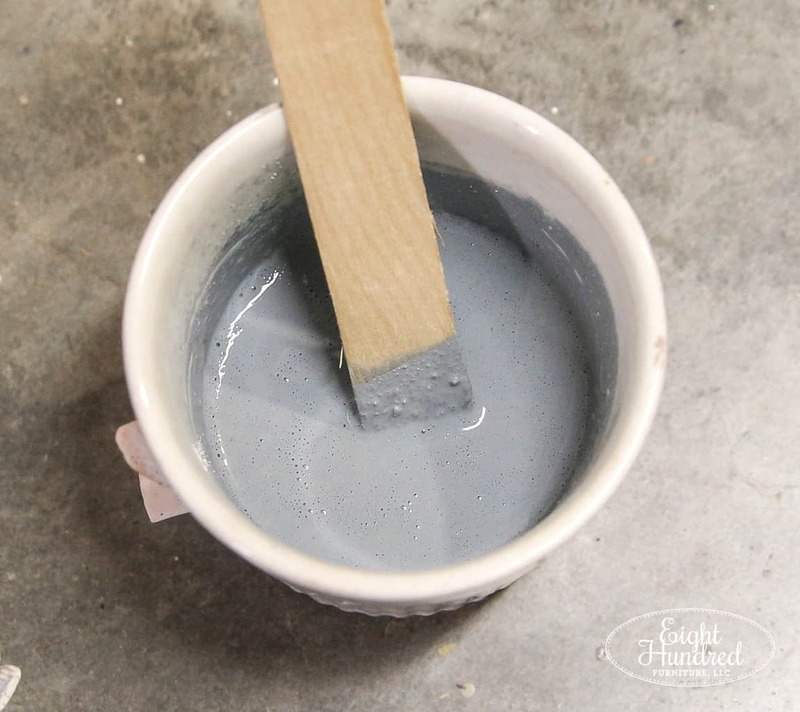 I truly love this smokey blue shade, and I’ve used it on several pieces in the past. Boy, can you tell some of those photos were from early on in my photography career? Some of those shots make me cringe, but hey…you have to start somewhere, right? At any rate, I mixed up 1/4 cup of paint for each coat. I painted on 2 coats total. 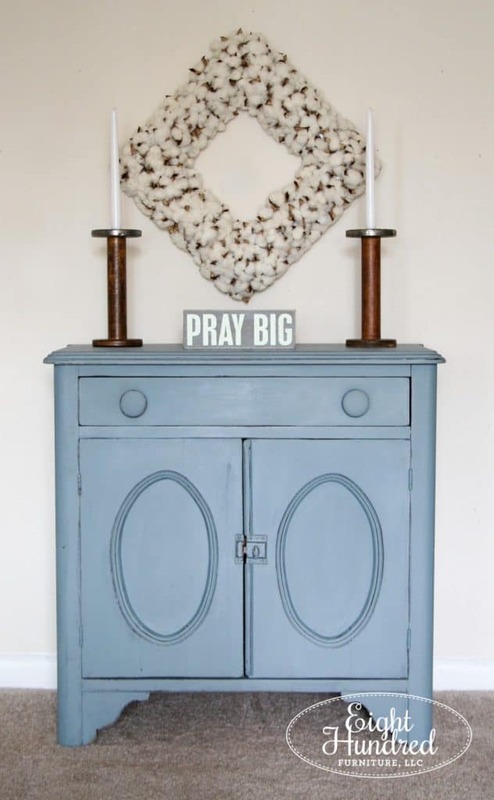 I kind of agonized over which color to use because I wanted it to be something a buyer could easily bring into their existing decor. It also had to coordinate with the fabric that I had purchased from Sweet Annie Acres for the seat. 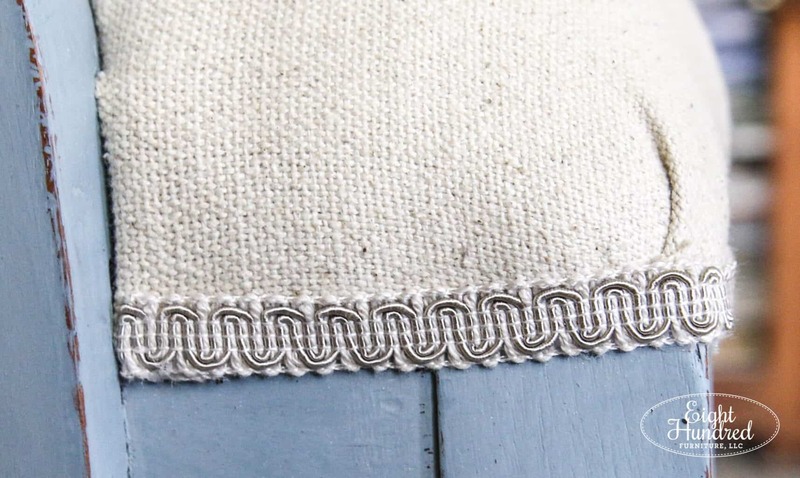 It’s a lovely nubby grain sack type fabric that is a light oatmeal color. 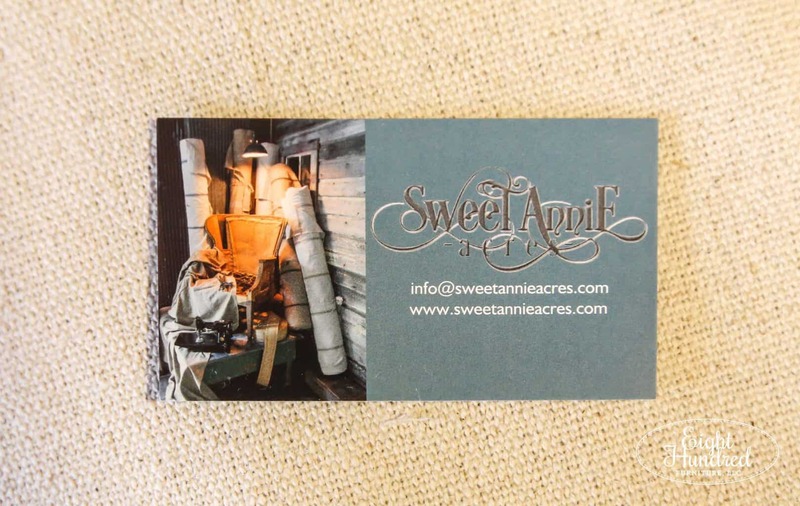 Sweet Annie has more colors and styles if you’re in the market for farmhouse style fabric. Here’s the settee after its second coat. You can see it was still drying in the photo! After the settee dried, I gently distressed it and smoothed it out. 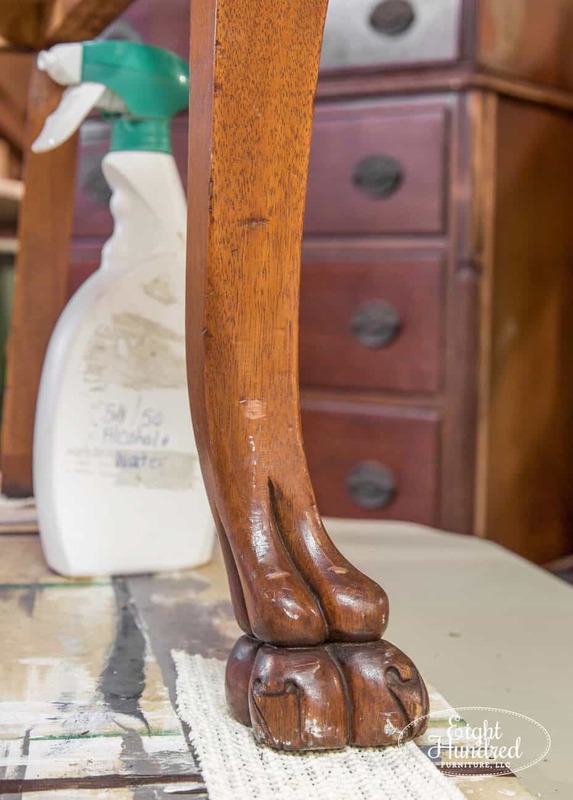 To seal it, I applied a layer of clear Furniture Wax. 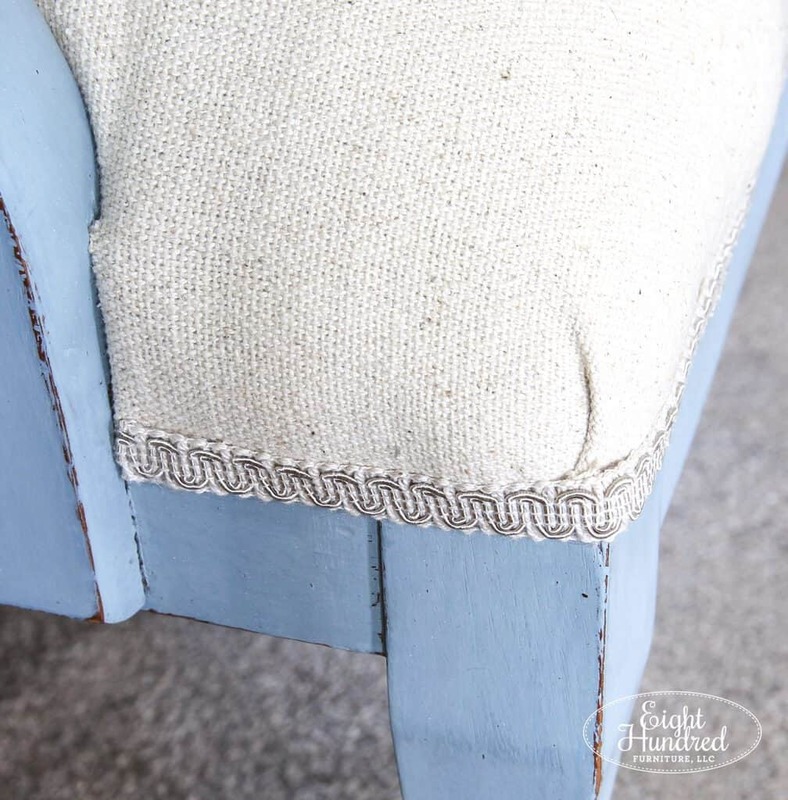 I’m not going to share how I upholstered the settee because I have spent the time and money learning this skill set by being a paying member of Kim’s Upholstery. 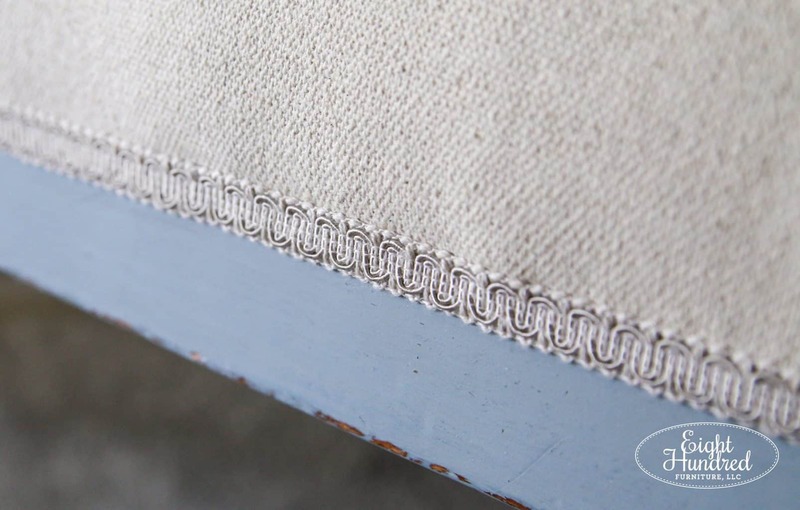 This is a membership site run by professional teacher and upholsterer, Kim Chagnon. I’m not about to give away that information for free, but you can certainly join me and become a member too! I’d love the company! This piece really came together quite beautifully. 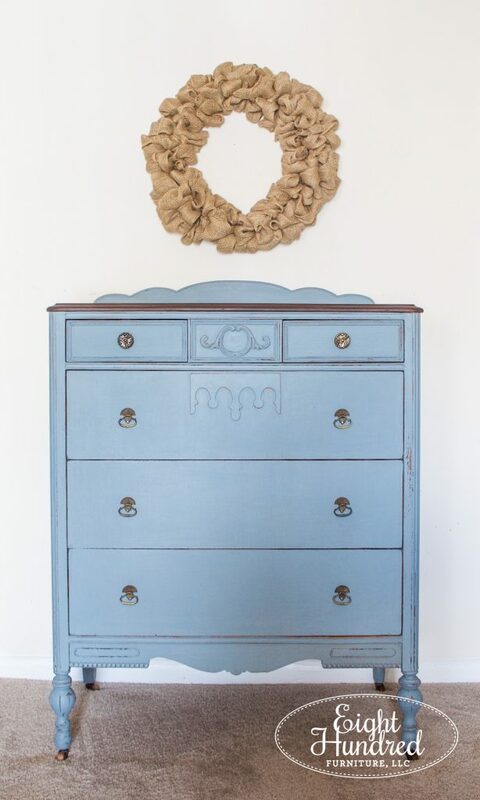 The Bergere MMS Milk Paint pairs so well with the nubby fabric from Sweet Annie Acres. Regardless, I have my trim and it looks lovely. 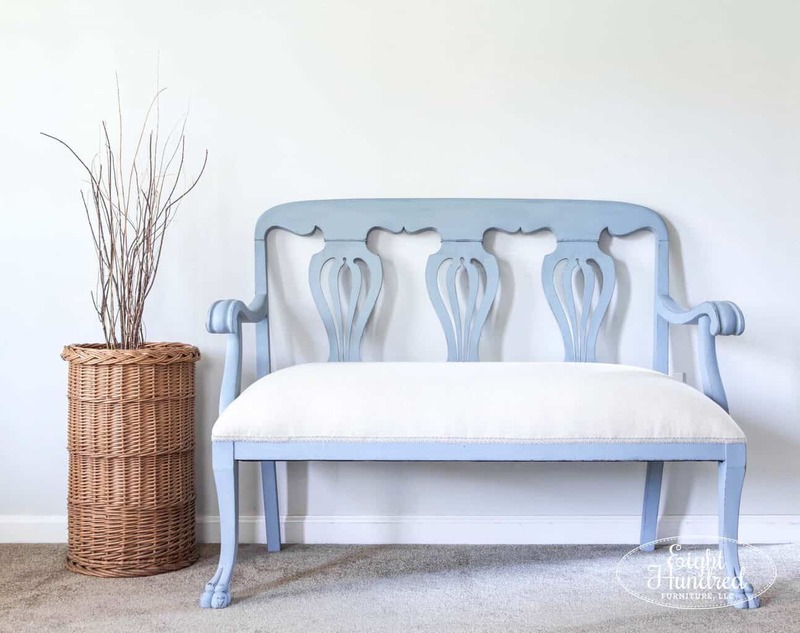 The nubbyness of the fabric gives this Chippendale settee the casual elegance I was aiming for. 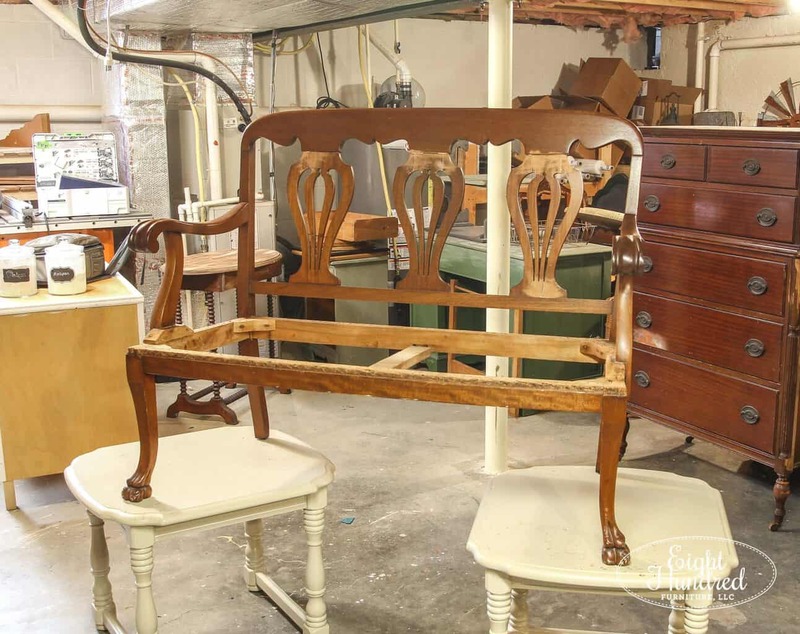 Chippendale furniture can be quite fancy and ornate. 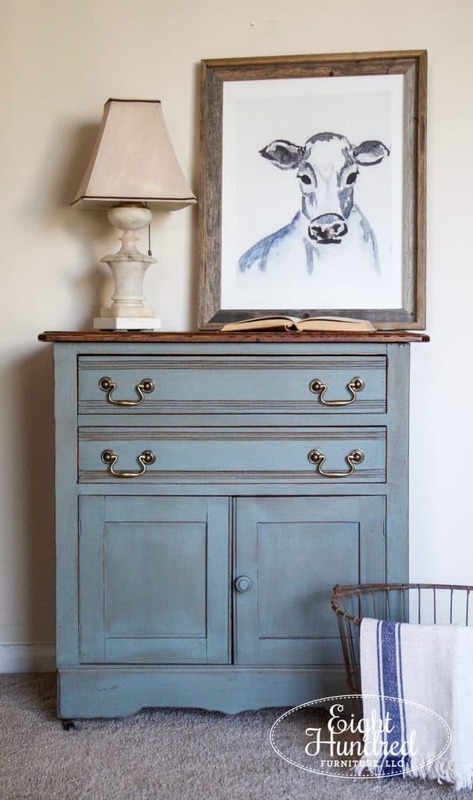 I like to quiet this style of furniture down with simple and more utilitarian details like this. 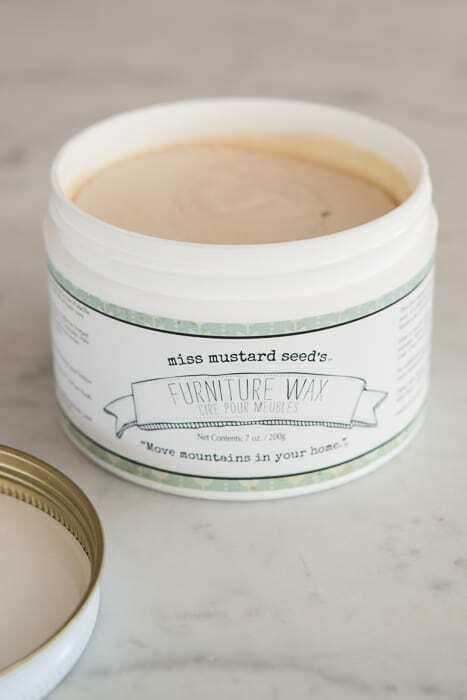 And by the way – can you appreciate how Miss Mustard Seed’s Milk Paint soaked into the surface like a stain? 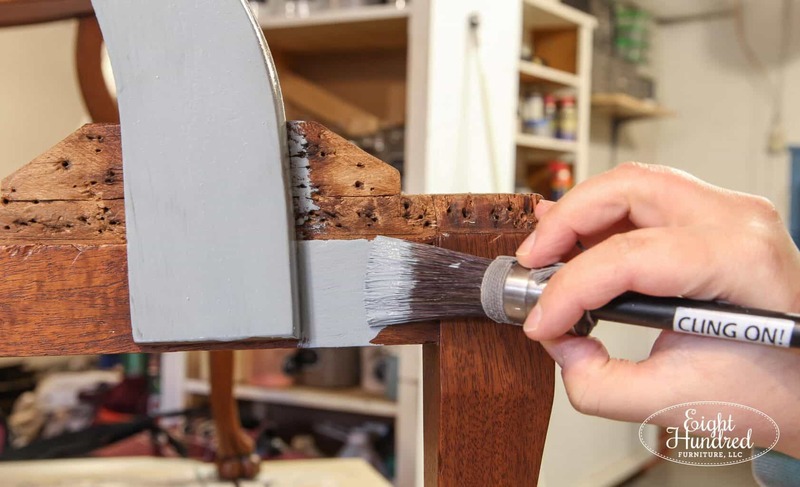 You can still see the grain and texture of the wood through the paint. That’s one of my absolute favorite aspects of this type of paint. The feet aren’t dust traps anymore! Speaking of dust traps, I finished the settee off with a proper dust cover on the bottom. When I brought it home originally, it didn’t have one and boy was it messy under there! The back side of the settee originally had fabric going across the bottom rail, but I chose to expose and paint that. I thought it looked more neat and tidy this way. 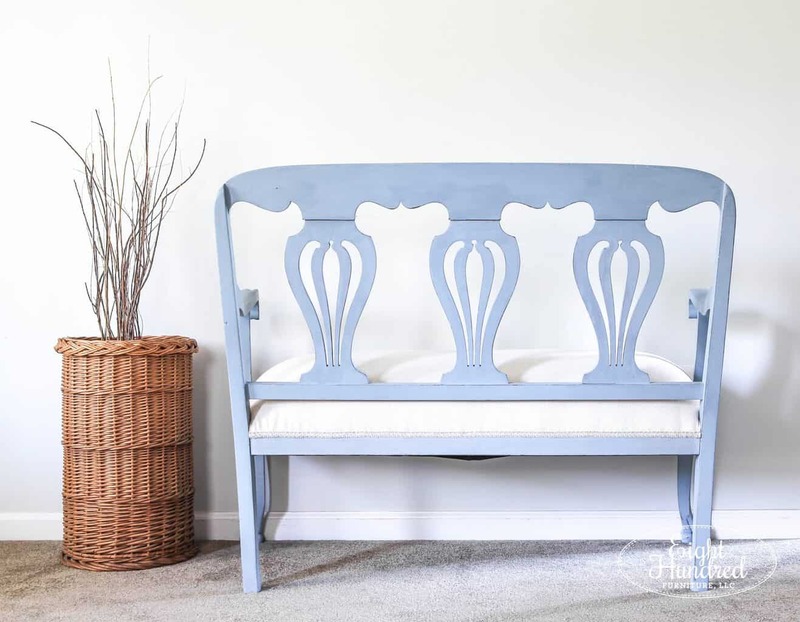 I plan on taking this settee to my booth at Morgantown Market as soon as I have a break in my schedule this week. 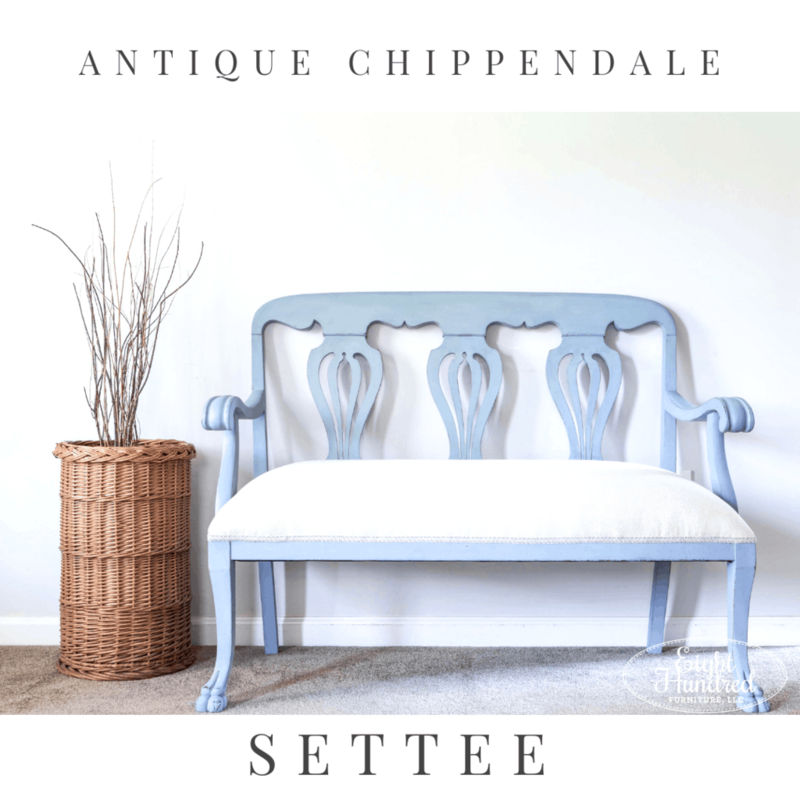 I’m so proud of this Chippendale settee. 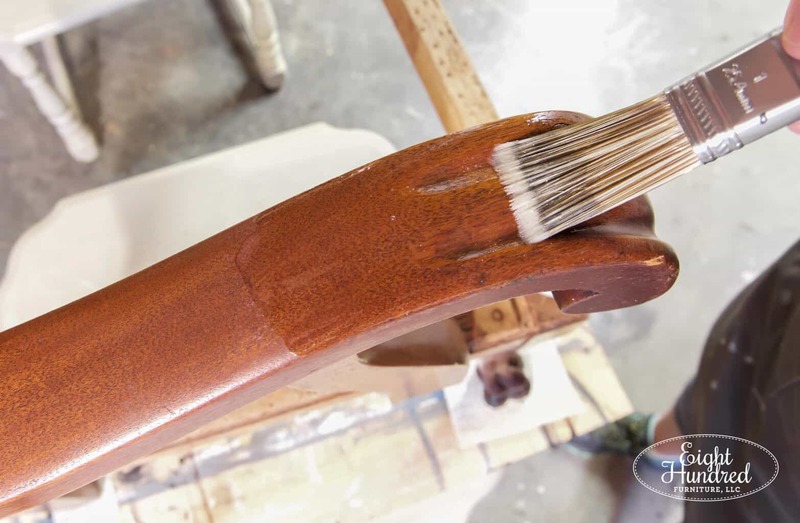 There’s a lot of labor in upholstery projects, so if you come across them in your travels, be kind and mindful of the work the artisan put into them. 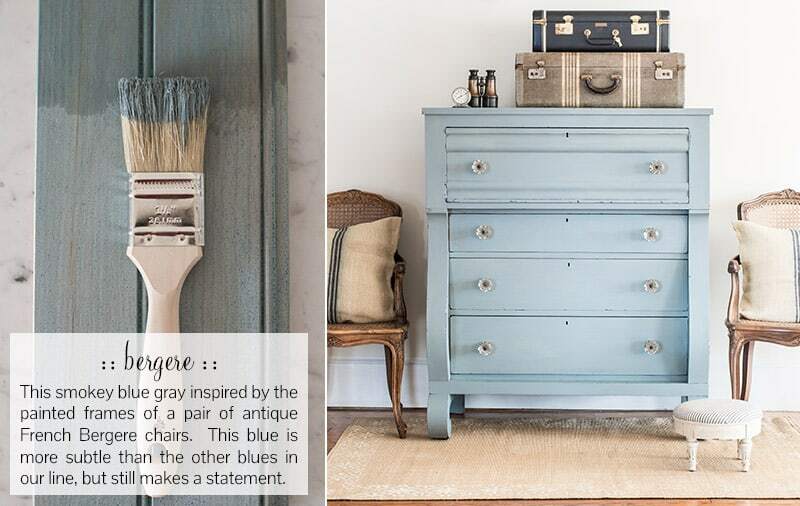 Pin this little guy to have ready if you need inspiration for your next paint/upholstery project! You can never go wrong with any shade of blue. It looks like you did a nice job and I know a lot of labor involved. I will pay someone to do my upholstering, never do I choose to learn or tackle this even if instructions were FREE. The settee turned out lovely! 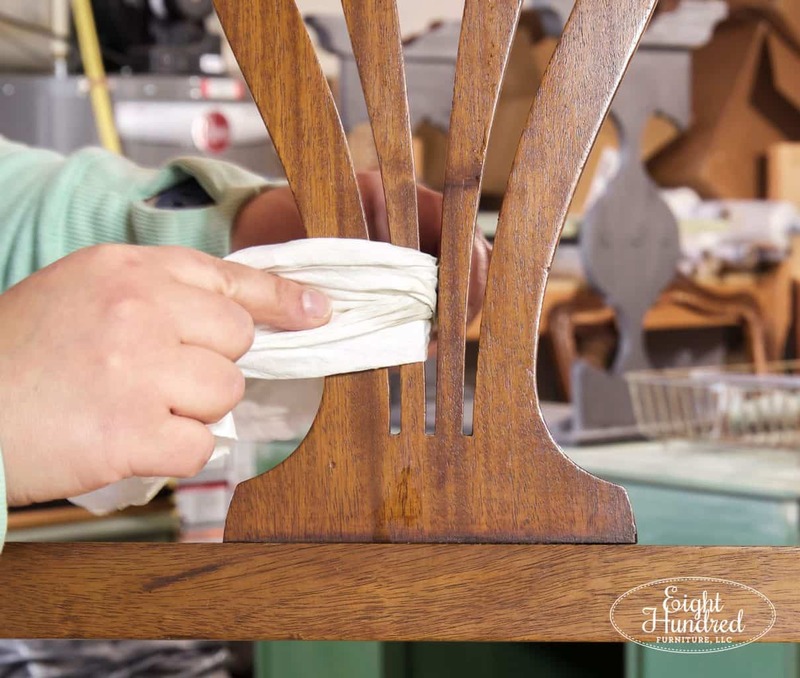 Did you know how to upholster at all before you joined Kim’s Upholstery classes? I have been looking at the website. 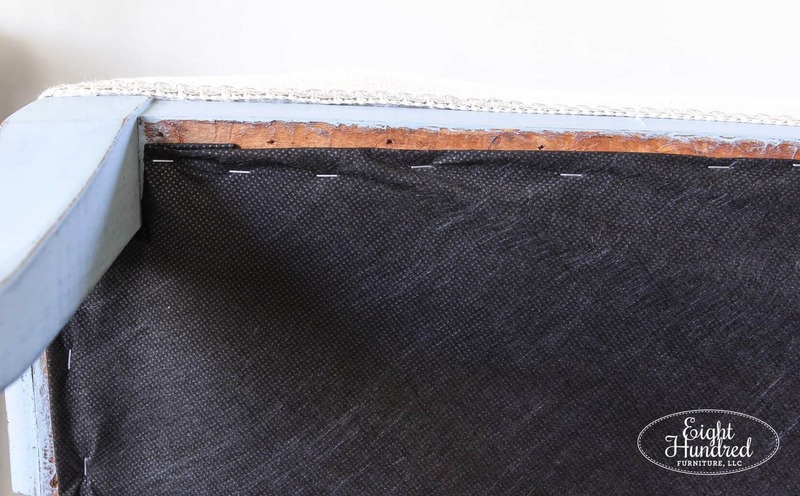 Would you say someone who has no experience upholstering could learn what you did with the settee solely from this online site? That would be amazing and well worth joining as a member. Is this at Morgantown yet? Beautiful job..